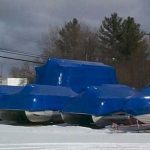 Lake Marine & RV offers affordable storage for your boat during the winter or summer season in our outdoor and or indoor storage facility. Boats are stored in an outdoor storage area with 24 hour access and are monitored by infrared security cameras and motion sensor flood lights. Storage is available year round starting at $39.95 per month at our 7 acre outdoor storage yard. We also have a 44,000 sf indoor heated facility and a 6,000 sf indoor cold storage facility. Cold storage is $6.00 per foot per month (Minimum of $89.95 per month) and heated is $7.00 per foot per month (Minimum of $110.00 per month). Don’t trust your boat or RV to some pole barn in a farmers field keep it safe in our secure, clean concrete floor storage facilities! 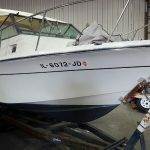 Lake Marine & RV also can perform all services necessary to prepare your vessel for Spring launch, including cleaning, waxing and bottom painting. We do not permit boat owners to perform repair work on their vessels at our outdoor storage lot but we offer very affordable service and are glad to offer free advice on repairs if done off site. We are located in the hub of the boating community, 10 minutes from Crystal Lake private lake community, 15 minutes from Wonder Lake Private lake community, 25 minutes from downtown Lake Geneva Wisconsin, and 45 minutes from the Fox Lake boating community. Storing your boat with us will make it easy to get out on the water without a long drive.